Richard Levin, the current president of Yale University who has held this office since 1993, will resign his post at the end of the current academic year. Levin, the longest serving current president of an Ivy League university, is regarded as one of the finest college presidents in recent memory, having accomplished so many of the objectives he set out to achieve upon taking office in the early 1990’s. His mark on Yale University can be seen in its sciences, engineering, and medicine programs. It can be seen on the Yale campus itself with its most comprehensive construction and renovation program since the 1930’s, and it can be seen in Yale’s global brand. 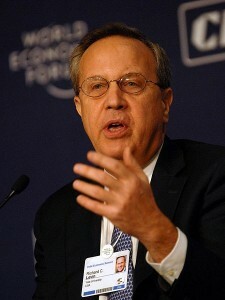 Rick Levin, president of Yale University, will resign at the end of this academic year (photo credit: World Economic Forum). As the Yale University president, Levin has been instrumental in fostering a sense of community between Yale and the City of New Haven. He has vastly expanded Yale’s financial aid coffers. He has been an outstanding fundraiser for the university, having raised over seven billion dollars. Yes, seven billion dollars! The Yale admission rate has gotten lower and lower and the university is as prestigious — if not more prestigious — than it ever has been in the past. We salute Rick Levin for his stewardship of Yale University and wish him well in his final year at the helm of one of America’s finest universities.